Tom grew up in Illinois and went to Moody Bible Institute. He and Phyllis met there and were married after graduation in 1988. Tom says that apart from salvation, marrying Phyllis was the best thing that ever happened to him. On their days off, Tom likes getting out in nature and observing God’s beauty and intricacy. Nature photography and rock collecting are two of his favorite hobbies. Seeing someone respond to the gospel thrills his heart and brings tears to his eyes. This is what it is all about! Phyllis was raised in the NYC area in a large family. She attended college after high school and received a degree in Merchandising. She worked in Manhattan’s garment center for 10+ years. During her studies at FIT (Fashion Institute of Technology) she received Christ. She became involved in a bible church near my home. This church sent her to Moody Bible Institute to be trained as a missionary. It was there she met her husband Tom. They were married August 13th, 1988. They have a cat named Léo. 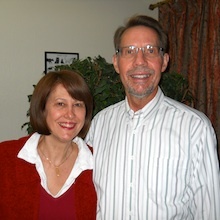 Thomas & Phyllis have committed their lives to bringing God to the resistant French thinking. They have been in France since 1993. Phyllis ministers in administration, music and women?s ministries. Thomas is the pastor of the Mennecy Church. Last year, the Mennecy Church had a pastoral candidate that was not voted it. This has revealed weaknesses in the church that need to be addressed and overcome before seeking another candidate.